Solution Treatment is the common heat treatment method for stainless steel castings. Solution treatment refers to the heat treatment process that heating stainless steel castings to a high temperature and keeping constant temperature, so that the excess phase is fully dissolved into the solid solution. Solution treatment aims to get uniform supersaturated solid solution by dissolving the carbide and γ phase in stainless steel castings, help to redissolve out fine and uniform distributed carbide and γ phase when aging, while eliminating stress due to cold and hot processing, result in recrystallization of stainless steel. Second, the solution treatment can obtain the suitable grain size, to ensure the creep resistance of stainless steel castings under high temperature. 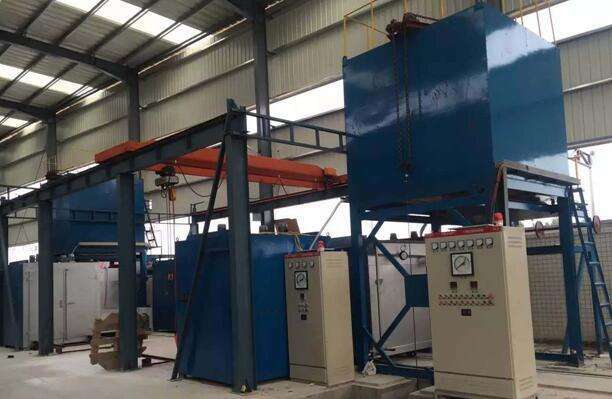 The temperature of solution treatment ranges between 980 ~ 1250 ℃, mainly according to the rule and using requirement of various alloy phase separation and dissolution, in order to ensure necessary precipitation conditions and certain grain size of main strengthening phase. Improve the plasticity and toughness of stainless steel castings, to prepare for precipitation hardening treatment, make all kinds of phase in the alloy dissolves at the same time, strengthen the solid solution, and improve the toughness and corrosion resistance, eliminate stress and softening, in order to continue machining to final dimensions and tolerances. Solution treatment is not limited to stainless steel components, it can also be used for other special steel, high temperature alloy, special performance alloy, nonferrous metal. Especially suitable for stainless steel components that will do further machining operation after casting. CFS foundry can offer solution treatment service after stainless steel casting. Any requirement on solution treatment for your stainless steel casting project, pls get in touch with us.